In a time when baseball, reeling from the 1919 Black Sox scandal, declining attendance and declining credibility, needed a revitalization, Babe Ruth saved the day. By destiny’s hand, the most visible, dominating, and popular athlete in American history was brought to New York City to play on baseball’s biggest stage. At the dawn of the Roaring Twenties, Babe Ruth turned baseball on its head, sparking fan interest and excitement, and the birth of the most enduring dynasty in sports history. As one of the games most promising young pitchers, Babe Ruth had led the Boston Red Sox to World Series titles in 1915, 1916 and 1918. Ruth's pitching mark was 89-46 with the Sox, but his booming bat was too loud to be heard only every four days. 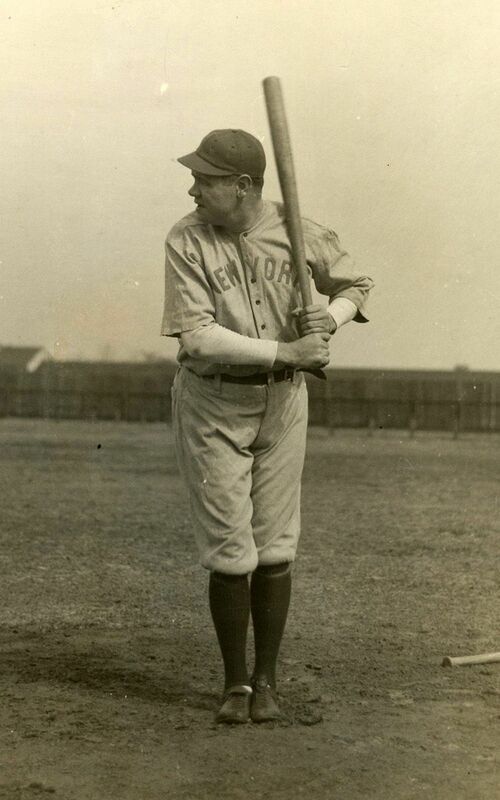 Red Sox manager Ed Barrow, at the suggestion of outfielder Harry Hooper, began playing the Babe in the outfield in-between his starts. By 1919, he played 130 games and was now an everyday player hitting home runs with unprecedented regularity. The long balls that flew from Babe Ruth’s bat also flew in the face of the games convention, changing its very nature with each successive clout. He seemed poised to lead the Red Sox to the top of the league for years to come. But, despite the Babe's obvious value as a slugger, he was dealt to the New York Yankees prior to the 1920 season, in a deal that would haunt the Boston Red Sox and their fans for nearly a century. America was in a social revolution as the 1920’s began – Prohibition went into effect on January 16, just days after the announcement of Ruth’s sale to the Yankees – and baseball turned around as radically as the country did. The game changed more between 1917 and 1921 than it did in the next forty years. 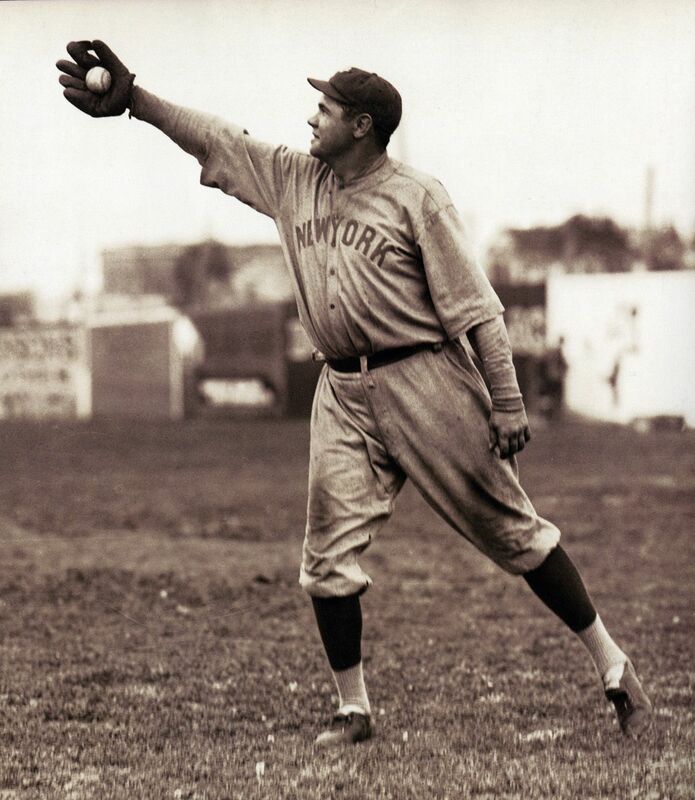 Despite the high-profile presence of such outstanding batters as Cobb, Wagner, Lajoie, Speaker, Jackson, and a few others, during the first two decades of the century hitting was a lesser art in a game that honored pitching and low scores. The term "inside" baseball was almost sacred, and John McGraw was its high priest. It meant playing for a run, a single run. Bunting, base-running, sacrificing were the core elements of baseball offense. All of this changed after Ruth’s transition in 1920. It was not a gradual evolution but sudden and cataclysmic. Crushed by his sale to the Yankees, Ruth was uncertain of his future upon his arrival in New York City. But his doubts failed to affect his performance in 1920. During his first season in New York Ruth clouted 54 homers, surpassing the combined totals of every other team in the majors except one. That same season, Ruth slugged an astonishing .847, a record that stood for more than 80 years. In 1920, the Yankees, coincidentally, became the first team to draw more than one million fans to a ballpark, more than double the attendance of any other club. Ruth (the highest paid player in baseball) made such a profound impact that he also meant more money in the pockets of owners and other players alike. As Hall of Famer Waite Hoyt, a teammate of Ruth’s put it, "Every big leaguer and his wife should teach their children to pray 'God bless Mommy, God bless Daddy, and God bless Babe Ruth.'" In the media capitol of the world, the combination of Ruth’s boundless charisma and unmatched prowess on the diamond, elevated him to a level of popularity in his day greater than that of any public figure in American history. Dating from the most pivotal era in baseball history, the offered jersey was worn by the man who almost single handedly picked up America’s Game by its bootstraps and restored its National pride. We present it, not merely as a piece of sports memorabilia, but as one of the most singularly important discoveries in the realm of Americana. 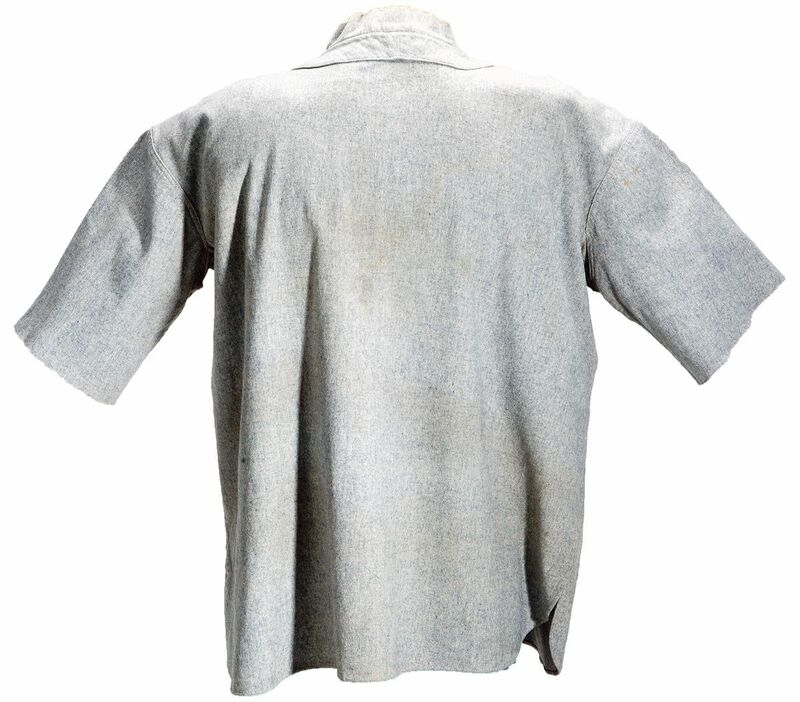 Never before offered for sale publicly, the lineage of this privately owned artifact traces back to a discreetly accomplished private Northeast collector, who generously loaned it for public exhibition at the Babe Ruth Museum in Baltimore from 2004 to 2009. Astonishingly well preserved, the professional grade wool jersey possesses many ideal physical traits identifiable to the circa 1920 period. 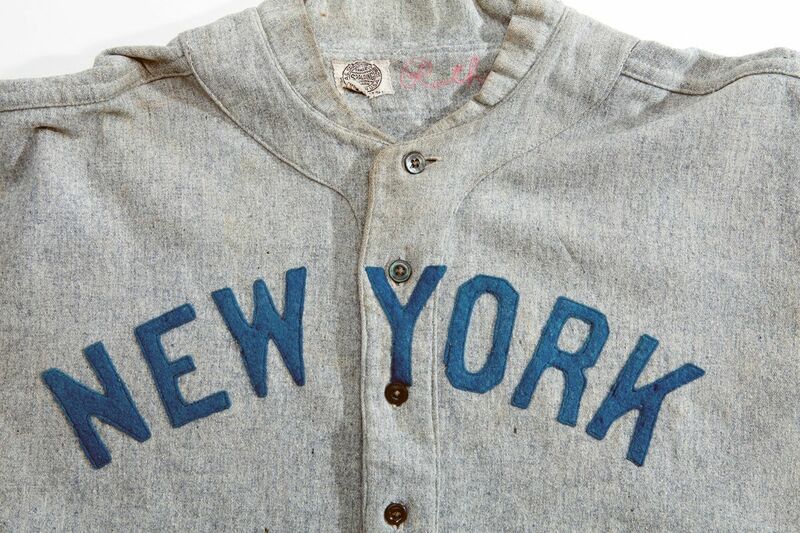 Among the combined factors indicative of a 1920 vintage is the style and positioning of the “NEW YORK” lettering stitched on the double-thick button placket and its period appropriate “sun collar”. 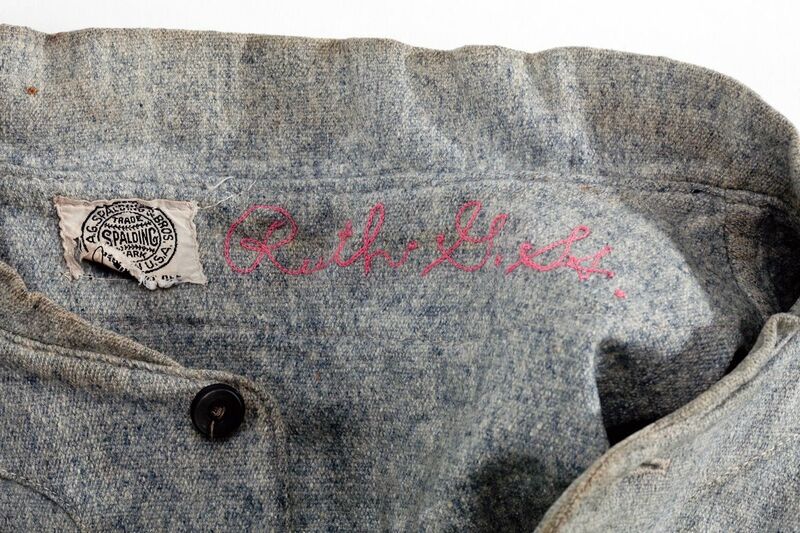 Stitched next to the Spalding manufacturer’s label inside the collar is the original, undisturbed name “Ruth G.H.” in faded pink script. A comprehensive documented analysis of the jersey’s originality, integrity, and circa 1920 vintage by leading third party uniform authenticator Dave Grob of MEARS is provided. The only post-manufacturer alteration noted in the MEARS study is the jersey’s cut sleeves. 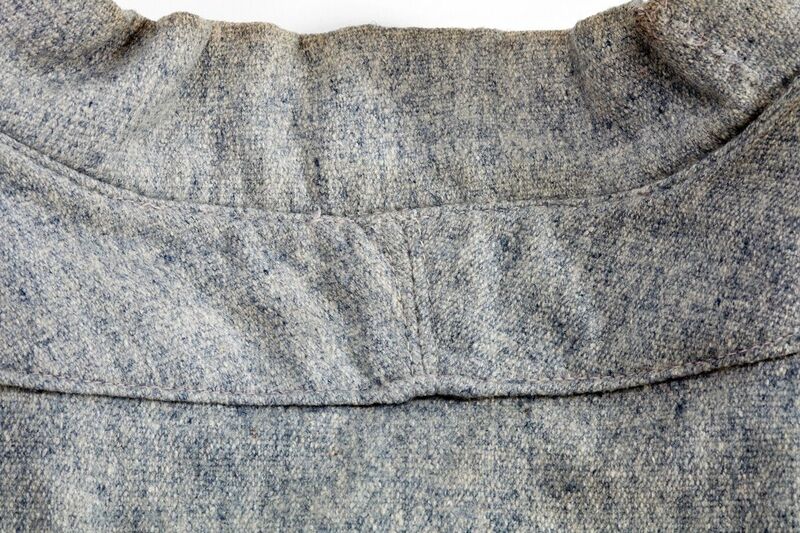 However, photographic evidence from the 1920 period showing Ruth wearing cut sleeves allows for the possibility that he initiated the alteration. The magnitude of this offering cannot be overstated. 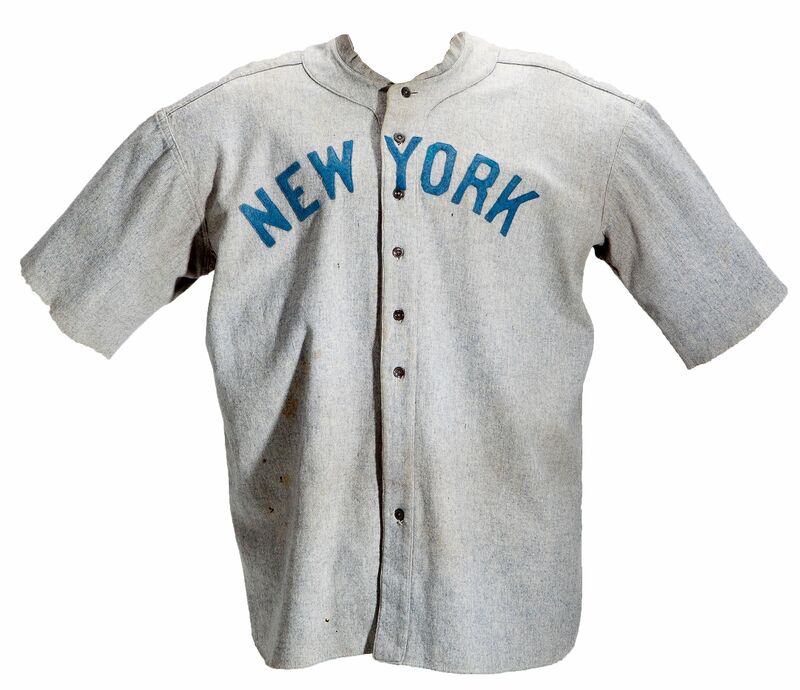 A jersey worn by Babe Ruth is the single most coveted object in the realm of sports memorabilia. 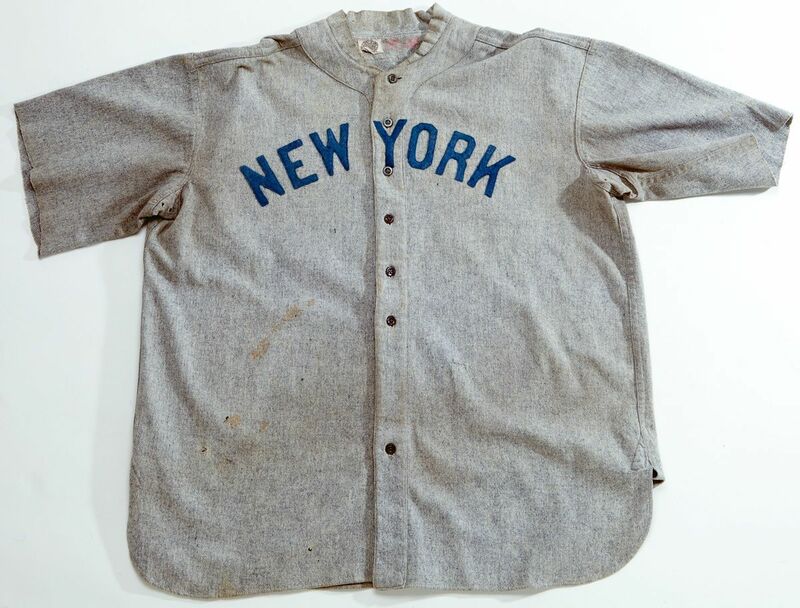 It is estimated that the number of completely original, unaltered Babe Ruth jerseys in existence, this one included, can be counted on a single hand. Appropriately, most of these reside in major public and private museums. Among this miniscule population of Ruth jerseys, the offered example is the earliest. 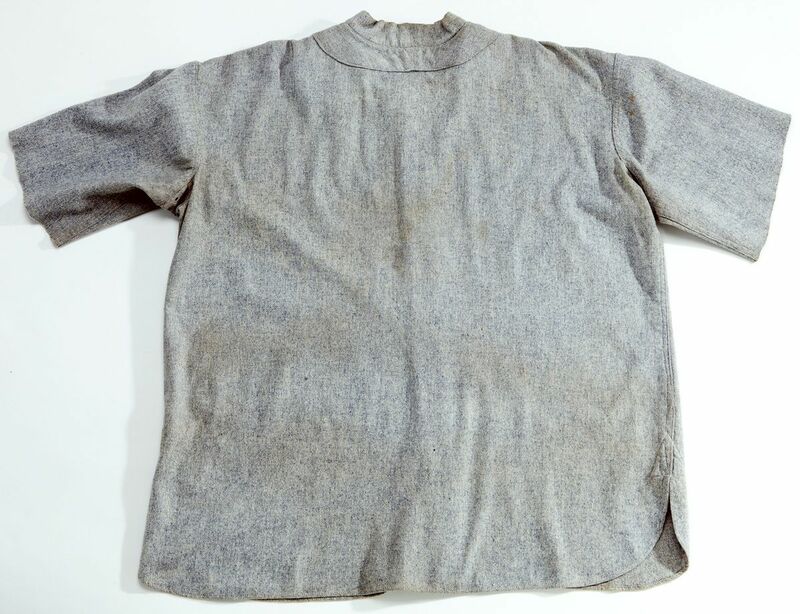 It’s remarkable condition notwithstanding, the significance of Ruth having donned this garment during the most historically important period of his career, makes this an unrivaled American monument. Less than a decade removed from a Baltimore reform school Babe Ruth transformed into the “Sultan of Swat” and changed the game forever. Babe Ruth was a man of mythic proportions. More than any other athlete, he transcended sports, achieving a nearly unrivaled status as an American icon. Like the man himself, this jersey is a treasure for the ages. Includes a LOA from MEARS (Graded A8).